Lightning Protection Services with Lusk Tree Services Inc. 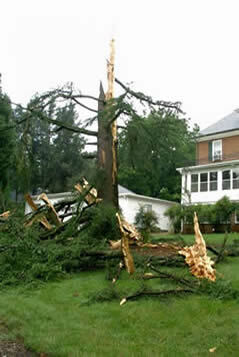 This is a dramatic example of lightning having exploded a specimen 80-year-old Deodar Cedar. Tall, unprotected trees are vulnerable to lightning.Lightning damaged this tree so severely that the tree had to be removed. Copper conductors and ground rods when properly installed can protect trees. These systems are effective. 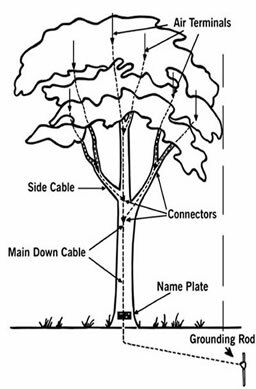 Please contact us with any questions regarding the cost and installation of lightning protection systems for landmark and specimen trees.This diagram shows the basic design of a lightning protection system from top to bottom. This diagram shows the basic design of a lightning protection system from top to bottom. The materials are made entirely of copper (see photos below of installation in progress). A custom fitted system can safeguard a tree from lightning damage by safely grounding and dissipating the lightning strike. Below Jacob Cofer ties on the main conduit cable for the climber who is attaching the copper stand cables in the crown of the tree. Once the aerial copper strands of the system are in place, the grounding cable is buried and attached to a 10-foot copper rod which is driven vertically below grade. All Installations meet ANSI (American National Standards Institute) guidelines.